Pimalai Prestige is a frequent patronage program designed to reward guests for staying at Pimalai Resort and Spa. The following Terms and Conditions are intended to protect members of Pimalai Prestige. Should you require further clarification, please do not hesitate to contact our Membership Services at crm@pimalai.com. 1. All individual guests are eligible for Pimalai Prestige membership. Pimalai Prestige membership is not transferable. 2. Membership in Pimalai Prestige is open only to individual residents in countries where the program is permitted by law. 3. Membership in Pimalai Prestige is valid within three (3) years. 1. The points of the Pimalai Prestige are based from qualifying room rates at Pimalai Resort and Spa. Food & Beverage consumption, spa, excursions, activities and other services may earn points. Service charges, taxes, and other incidental charges are not eligible for Pimalai Prestige points. 3. Members may log in to the Pimalai Prestige members' portal www.pimalai.com to check their Pimalai Prestige point balance and transaction activities or email the Pimalai Prestige Membership Services Manager at crm@pimalai.com, to get an update. 6. Pimalai Prestige points are credited to members as long as they stay and pay for the room; or pay for any use of facilities or services at Pimalai Resort and Spa. 7. A guest must have been enrolled as a Pimalai Prestige member at the time of stay in order to earn Pimalai Prestige points. 8. Pimalai Prestige Points are valid within three (3) years only or 36 months from date of issuance. 1. Members are required to present their Membership e-Cards to enjoy privileges and/or discounts in the Hotel or with Pimalai Prestige participating partners. The Hotel may request for additional identification cards for verification purposes. 2. The privileges and/or discounts will be extended only to the Members whose name appears on the e-card. The e-card must be presented in order to enjoy the membership privileges and/or discounts unless otherwise stated. 1. Your Pimalai Prestige Membership e-card remains the property of the Hotel. Use of your Card constitutes acceptance of the benefits, privileges and the terms and conditions listed herein. 2. Whenever there is a change of personal particulars, it is the Member's sole responsibility to update their membership record in the Pimalai Prestige Members' Portal or inform Pimalai Prestige Membership Services in writing. 3. The safe keep of the Reward Certificates is the sole responsibility of the member. There shall be no replacement of reward certificates. 4. The Pimalai Prestige Membership Services Office reserves the right to correct any Member statements or Pimalai Prestige Point accruals or balances that are incorrect due to processing errors. 5. The Hotel reserves the right to amend the rules, restrictions, program benefits, and special offers without notice. 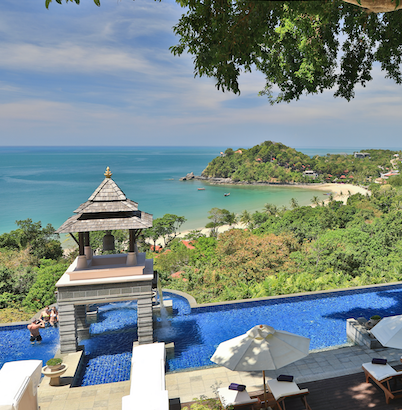 The Hotel reserves the right to terminate the Pimalai Prestige program at any time. 6. Earnings of Pimalai Prestige Points and redemption of Rewards are subject to all applicable laws and regulations. 7. Benefits and Rewards received under Pimalai Prestige may be subject to taxes. Such taxes are the sole responsibility of the Member who is the recipient of the said benefit or Reward. 8. The Hotel makes no warranties or representations, whether expressed or implied, and expressly disclaim any and all liability (including consequential damages) with respect to the quality of goods or services claimed, redeemed and/or enjoyed through the Pimalai Prestige. All conditions, warranties or other terms implied by law are excluded to the fullest extent permitted by applicable laws and regulations. In the event any Member transfers the use of any Reward Certificate, this Clause shall also apply to the transferee. 9. The Hotel and/or Pimalai Prestige reserve the right to adjust the Pimalai Prestige Point values as and when necessary to reflect changing market conditions. 10. Fraud or abuse concerning Pimalai Prestige or Reward usage is subject to appropriate administrative and/or legal action by the Hotel and/or participating partners. 12. Pimalai Prestige Loyalty Program is a program operated by the Hotel. Service providers may also have access to Members' records. 13. All interpretations of the Program Terms and Conditions shall be at the sole discretion of the Hotel. In the event of any dispute, the Member agrees to submit to the exclusive jurisdiction of the courts of Thailand.